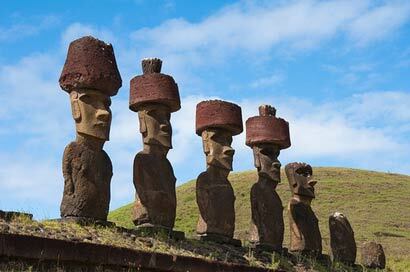 West of Chile some twenty-two hundred miles, and almost three thousand miles southeast of Malden Island, is Easter Island (Rapa Nui). Traditionally, its only fresh water was caught and held during the rainy season by extinct volcanic craters. In the late 18th century, when visited by Captain Cook, there were fewer than 1000 primitive inhabitants living there. On the island there are great burial platforms of tooled and surfaced stones, each ranging from two to twenty tons in weight; also immense pyramids and monoliths which unquestionably required tens of thousands of workmen and scores of years to build, not to mention considerable ingenuity and skill. Today the Island’s titanic statues (Moai) are broadly recognized. These statues, admittedly somewhat crude in workmanship, are carved from a very brittle volcanic stone called tuff. They range from ten to thirty-seven feet tall and weigh from thirty to eighty tons each. The original bases, Ahu, were of matched and expertly surfaced stones oriented astronomically, the work almost identical to that found in South America as well as in parts of Asia and the Middle East. Many of the platforms were destroyed and poorly reconstructed in more recent times, bearing little resemblance to earlier work. Each statue bears, or has borne, a red sandstone cap, from two tons in weight on the smaller statues to ten tons or more on the largest, placed after the statues were erected. From Hawaii itself, with its magnificent sunken gardens, to Pitcairn, Tahiti, Fiji, Oleai, and Yap—not to mention a score of other island groups throughout the South Seas—these imposing edifices are duplicated, though in smaller versions.